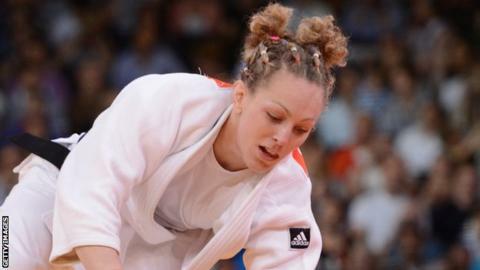 Sally Conway won Great Britain's second medal of the Baku Grand Slam in Azerbaijan with silver in the -70kg category. The 27-year-old lost out to world number one and European champion Kim Polling of the Netherlands in the final. It followed gold for Colin Oates in the -66kg event on Friday. The Grand Slam is a top level event on the International Judo Federation's world tour. "I've wanted to fight Polling for a while now and today I got the chance," said the Edinburgh-based Conway, who originally hails from Bristol and is Britain's top ranked judoka. "Although I lost the contest I've taken some positives from it." Conway will be aiming to represent Scotland at this summer's Commonwealth Games from 23 July to 3 August while Oates is set to compete for England. The 30-year-old Norfolk fighter beat Kamal Khan-Magomedov by ippon to win his first Grand Slam title. "It's a great feeling for me to win my first Grand Slam," he said. "What's important now, with Olympic qualification starting, is to maintain this level of performance consistently."